Nothing ruins a fun day faster than a flat tire. 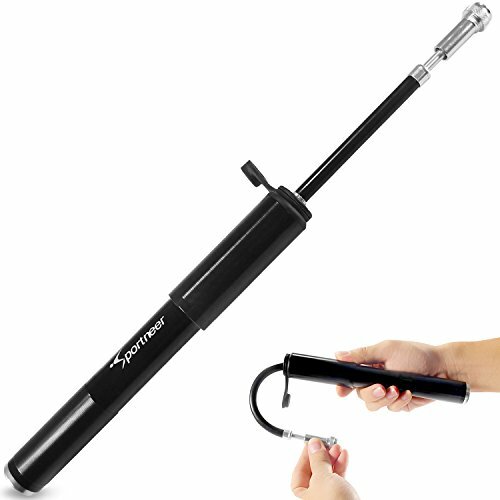 Maybe you've got a puncture, have been riding for too long, or simply forgot to inflate before heading out- no matter the issue; the Sportneer Mini Bike Pump can handle it all. The high-pressure inflation (160 PSI!) can inflate mountain and road bikes in a flash. Thanks to the light aluminum body, compact size, and mounting bracket, you can clip this pump onto your bike so that you're prepared at all times. You'll enjoy other great features like a glue-free tire repair kit, interchangeable valves, and an air needle for inflating sports balls. This hand pump is an indispensable addition to your sports equipment collection. It's the perfect tool for your active lifestyle. Note: The mini pump contains lubricating oil inside. Clean the pump and bike valve before inflation.